Space the un-minable frontier? Humanity has gone through a series of industrial revolutions; this has affected lives for better and worse. Mining, whilst essential, strips resources and destroys vast ecosystems across the planet. Earth has a finite amount of resource, eventually we will have to look further afield to satisfy our technological needs. The planting of a US flag on the moon symbolised the beginning of a battle; who owns space; moreover, who can take what from space? Since 1967 treaties and laws have been passed by international organisations, such as the UN, and sovereign countries protecting celestial land and assets; however, countries and companies are now looking at viable methods of mining bodies in space. Asteroids are plentiful; furthermore, they have an abundance of precious metals and water. As a result they have the potential to act as fuel stations for further travel and fulfil our demand for materials back home. Moreover, mining has the potential to change the perspective of space exploration; for the first time it could be economically viable to go into space. The vast profit generated from the proceeds of asteroid resources could revolutionise life on Earth across borders. 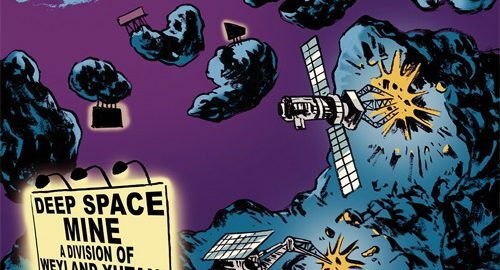 In theory everyone can benefit from space mining: the Outer Space Treaty (1967) states that ‘the use of outer space should be carried out for the benefit of all counties’; hence, the wealth generated should be spread accordingly. Earth’s resources are depleting. Precious metals, such as platinum, are commonly used in the chemical, automotive and electronics industry. Platinum does not occur naturally on Earth; all of Earth’s platinum was once deposited from meteorites that impacted our planet.It’s predicted that at current consumption rate we have 15 years of platinum left; there is more platinum on one asteroid than there is currently on the Earth. A 1 km diameter asteroid could contain 7,500 tonnes of platinum worth $150 billion. Mining could help us meet future resource demands on Earth, create jobs and economic growth through the development of a space industry. Rockets require large amounts of fuel just to leave Earth’s gravitational field; asteroids have the potential to act as interstellar fueling stations allowing deeper penetration into space. The water on the asteroids can be hydrolysed to form rocket fuel allowing for the opportunity to refuel whilst on a mission. Moreover, it could help us increase the number of space missions when combined with reusable rockets – a technology currently under development. The presence of water in asteroids will allow us to create an infrastructure for future developments, experiments and exploration. This developed space infrastructure could lead to an improvement in our civilization state. Mining asteroids preserves the Earth’s fertile land and ecosystems. Mining leads to many environmental issues such as air and water pollution, destruction of terrain, biodiversity loss, soil erosion, and sinkholes. Taking the mining industry off the planet and onto to asteroids will help preserve and protect the planet. Asteroid mining is more sustainable than traditional techniques by offering valuable resources without the expense of our home planet. The benefits of asteroid mining are clear; however, it may not be an ideal solution. Ownership of materials mined from celestial bodies is legal according to American and Luxembourgian law; however, this contradicts the original international treaty against ownership of alien material. These legal efforts made by the US and Luxemburg can be seen as a violation of the Outer Space Treaty (1967) in pursuit of their national interest. It is unlikely that governments would mine asteroids; alternatively, it would be private companies that would orchestrate the mining. This could also violate space treaties as only they would profit from the products; furthermore, it could create a massive monopoly that could control the supply and market of a precious material. As humanity increases space activities the amount of space debris in low earth orbit also increases; once it reaches a critical point collision are inevitable creating even more projectiles. Eventually the amount of high-speed objects will prevent any more activities in space as craft will not be able to pass through this region; this is known as the Kessler Syndrome. Space debris is of increasing international concern as it has the potential to wipe out the global satellite network and spacecraft. Harvesting minerals from space could lead to contact with foreign biomatter; this biomatter, that is completely new to Earth’s environment, may cause devastating effects on our ecosystem. Many scientists believe that life arrived on Earth from an asteroid; if we mine asteroids we could potentially inhibit another species from developing. Moreover, the dangers of bringing objects into Earth’s orbit for mining purposes could lead to the biggest risk of all – mass extinction. This impact could have a devastating effect unlike anything since the extinction of the dinosaurs. The processing of many rare earth metals are toxic to organic life; furthermore, it discourages the movement towards a circular economy. Retrieving these materials from space would have a detrimental impact on the environment – further damaging our planet. Rare earths and toxic metals used in electronics and other industries are rarely recycled or reused; they end up in landfills polluting our environment. An increased quantity of these substances on Earth due to asteroid mining would have a significant impact on the planet. Asteroid mining is a massive investment, costing tens of trillions of dollars to facilitate. Unsuccessful attempts may lead to huge economic setbacks on investors and governments which subsidise these attempts. This amount of money could be used for other more secure purposes, such as solving world hunger, medical research or other humanitarian actions, which have a less risk involved. The potential rewards of asteroid mining are lucrative and could revolutionise mankind by the development of a space industry and drastic global economic growth. The extravagant initial cost of required investment will lead to the inevitable privatisation of the space industry. Privatisation of such an influential industry can lead to a global monopoly of resources while violating the Outer Space Treaty, breaking international law. Is asteroid mining the future, or will we end up like the dinosaurs? We are for asteroid mining. ← Shut up and get on the rocket! The only thing that concerns me however, is how they will resolve if two bodies want to mine on the same asteroid? They will need to ensure that legislation is set out well in advance to avoid people taking advantge of gaps and loop holes to extort massive financial benefits. I believe it needs to be seriously looked at as a potential business over the next 5-10 years. Asteroid, Paper, Scissors? I imagine based on what’s happened in the past it’ll be treated as a first-come first-serve, whoever claims a certain asteroid gets to mine it. It will probably be similar to how it is on earth, someone buys a plot of land and It gets mined by a mining company. Someone will buy an asteroid and it’ll get mined by a space mining company. I agree first-come first-serve is probably the most likely way it could end up. But imagine the consequences if a private company owns all the Platinum supply (available to the planet)….they could have huge power. I think nations will find ways to regulate this! They could also control the commodity prices and flood markets; even though dumping is illegal, if one entity has complete control then how could this be controlled/policed? China are known to do this, it’s very difficult to prove and harder to control. As others say, strong legislation is needed. I had no idea asteroids could provide so much wealth in the form of Platinum! Having read this, asteroid mining seems like a natural progression in the future of the space industry. Why have Luxembourg have invested in this? Could the US be sued for breaching the international space treaty? I would image it’s due to Luxembourgian tax laws, it’s a known hot bed for low tax and will entice companies to have offices there pulling money into the country. The US could face potential legal action, it’s why I’m of the opinion that the treaties need to be changed, rewritten and updated for a modern, industrialised, world. Great article, very well balanced and informative. Who knew asteroid mining could be such an important industry in the future! If we are able to colonise Mars one day, launching space mining vehicles through its thin atmosphere would be much easier compared to Earth and therefore significantly cheaper. Not to mention safer. Launching from Earth through the myriad of space junk that is up there at the moment is incredibly dangerous. Solid read, some interesting points raised. However space still isn’t an infinite resource, just like earth there are only a finite number of asteroids with a finite number of rare metals. Are we not just delaying the inevitable as we are here on earth? I can imagine space mining leading to similar situations here on earth in that there will be conflict over the “resource grab”, especially given the vast quantities of metals and subsequent value one asteroid holds. Could we be on the verge of Meteorite Wars? True space isn’t an infinite resource, it’s another method of stalling the inevitable. Who knows what will happen by the time we potentially reach a point where asteroid resources become scarce. Our technology could have developed to such an extent as to sustain our needs in various other ways, we can hope at the least. Really good point. It’s very easy to consider resources as infinite; moreover, a counterpoint is do we actually need these resources? Should we just change our manufacturing approach on Earth and use alternatives? Will we actually need platinum in the future when we move towards electric vehicles? One thing we might need is water, and this could be a potential source of conflict on Earth in the future, this may make asteroid mining a humanitarian issue. To me this just seems like another instance of prioritising economic growth over our environment – surely it would be better for humanity to develop more environmentally friendly + sustainable ways of living rather than prolonging our ultimately unsustainable lifestyle through draining another resource? Yes, but whats the harm in collecting even more resources to more efficiently live an advanced lifestyle. Advancements to reach other planets could prove beneficial to humanity. It’s something we’ve been doing for a long time. My concern is that if these companies become large enough they’ll command a significant lobbying power reducing legislation and generating greater profits at the cost of the environment. This is something we’ve done time after time after time. An interesting yet sad read. It is truly a shame that we have reached a point in the human race where we now need to look beyond earth to find more ways to create sustainable life on our planet. Asteroid mining, whilst expensive and somewhat complicated, is an excellent solution, but at what costs? We risk damaging other unknown ecosystems. however, this is the consequence we must pay and a risk we must take. I look forward to reading about other advancements this sort of technology will make. Is it sad? Is it sad because we’ve inefficiently used resources on Earth or is it part of the human condition to go out and explore? I agree though, damaging unknown ecosystems and, in a worse case scenario, potentially stopping an alien race developing (unlikely, but theoretically it could happen) could be catastrophic. Fascinating read but what happens to the existing market when billions of pounds worth of resources are brought back, would this not crash the market deeming the viability of the asteroid mining not profitable? This is a big concern; moreover companies could dump and have a complete control over a market, this could be incredibly dangerous and a strong, robust legal framework is required. A good read. I would personally like to see mining venture off to space and would be interested to see the effect on cost of material. Are there any significant asteroids being studied which have economic potential? @DaddyYeet I expect such a vast wealth of resources would be mined in a manner to prevent this (I’m sure the economist have a term for this). After all, mining an entire asteroid would take time and would be an on-going process. It could be that just 1% of the Platinum was extracted in a given year…. to maintain market value or just for feasibility. Don’t forget, we expect the extraction of water to be the first resource of interest. Yeah, NASA and a couple of private firms have identified some ‘local’ asteroids. Missions have taken place to land craft and probes on asteroids as well; however, there is still a technological bridge to gap. Cracking stuff and a potential solution to so many of our problems hidden in plain sight. A few question remain unanswered however – what proportion of asteroids hold useful material and how many of these are accessible within a resonable time frame? How far along is our current technology? Are the time frames too great for private investment to be realsitc? If not are there any political movements for state funding and developemnt? A very interesting topic and one I will be sure to look further into! Difficult to say. I think a lot of it depends on our attitude towards it and how hard we push for it, which will be based upon demand back here on Earth. I personally didn’t think private space exploration would happen, but as public perception changed after the shuttle disasters and the Cold War, less and less public money was pumped into NASA, private exploration seems the only logical way forward. Not sure if this is just because they can, i.e. they have the money – a vanity project, or because these private firms actually think it’s worthwhile. An interesting read. Especially the counter-intuitive idea of asteroid mining as a more sustainable alternative to the present mining industry. Very well balanced on the subject. Thanks, mining on Earth (particularly rare-earth mining) is very dirty and dangerous to the workers. Many workers in China and Africa are exposed to horrendous conditions. What an interesting, well balanced but sadening report. All my ethical concerns about this topic are raised by your report but suggested alternatives are sparce. For example, funds spent on developing asteroid mining could instead be allocated to discovery or recovery of precious raw materials. Our planet has so much that is undiscovered. Surely we must change our mindset before we venture into space mining and become better custodians of our own planet; it is tempting to continue as before to explore and discover new sources of materials that perpetuate the cycle of consumerism./industrialisation . I would be interested to know if you had made your minds up on the outcome of your report prior to writing as this so often influences the outcome and I don’t feel you’ve really addressed alternatives. Thanks, it’s difficult to say. When we started I was on the fence, but as we explored and debated more as a group I became more and more for it. Not that I think we should push for it, but it seems like a natural progression from traditional mining. Interesting article, astoreid mining may give us more resources that we have now. However, foreign biomatter is quite a concern. Have to be aware of hazardous lifeform that can harm the species on earth. If the available resources is in large quantity wonder will it actually affect current market price? Yeah that’s a serious concern, lots of people have identified it in the comments. Again, a strong legal framework is needed with strong legislation that is backed globally. As discussed in this article, the Earth has a finite amount of resource. With population growth and technological developments there is huge demand to meet the needs of our advancements on Earth. It’s evident worldwide that we’re exploiting our natural materials, with devastating impacts to the environment, wildlife and society. The steady adoption of recycling and re-purposing used or old resources is potentially shifting the materials market space, but is it enough? Space mining poses a strong potential solution to providing additional resource to the Earth, which is an exciting prospect with various benefits including the opportunity to delve further into space exploration. From the Earth’s standpoint, it could reduce pressures on the environment by moving the extraction of resources away, to outer space. Yet, ethical concerns are prevalent, such as the terrifying risk of mass extinction – is it risk worth taking? It’s certainly a topical and large debate and one definitely worth discussing. Our Earth can’t continue sustainably with our destructive acts of exploitation. Why don’t we use resources from elsewhere (in space) with less direct damage to Earth, especially when these asteroids have no other known use? It’s believed by some (although, not yet proved) that asteroids could be the sources of life for future civilisations. Some believe that life arrived on Earth from an asteroid; hence, by mining and removing these asteroids, we could stunt the growth of another civilisation. Arguably, that would be the greatest cost. Of the four theories which one/s support/s asteroid mining? Which one/s oppose/s it? Something you need to focus on for Assignment Two. Should we invest in healthcare technologies that are primarily intended to extend the life of terminally ill patients?